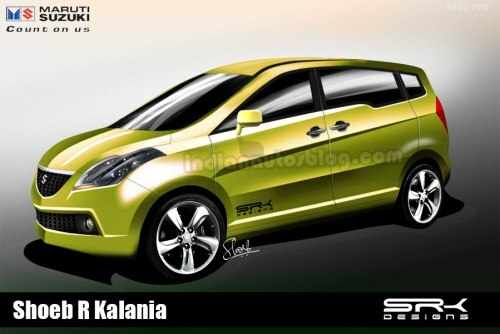 Photoshop man SRK is back to pace delivering drawings of vehicles years away from production lines. The latest creation of his - Maruti R3 MPV concept showcased at last month's Auto Expo. The Maruti R3 concept is a work of Indian engineers who have conceptualized it entirely using their imagination. The production model which could travel Indian roads by 2012-13 would also have cent percent Indian content. It would be the smallest MPV on Indian roads according to the management and according to recent reports, it could be sold without the "Suzuki" badges. We can't speculate on drivetrains as it is way too early in the game. We can safely expect Maruti to offer an electric powertrain similar to the one on the Maruti EECO. Hybrids and diesels could also be added to the equation at a later date. For a start, diesel engine with CRDI, turbocharger and a 5-speed transmission is our prediction. SRK feels the doors need to open facing each other as it would be a unique touch. The addition of fog lamps, realistic bumpers, rear view mirrors and a Kizashi-inspired headlamp lend it a production-friendly design. The Suzuki A-Star was a big let down, as much of the concept's features failed to translate into the production model. With the Maruti R3, one can only hope that most of it is carried over. Suzuki to launch R3 in Japan before landing it in India? Is this what the Maruti Suzuki R3 would look like?